In addition to artistic considerations, in planning photographs a number of technical operations must be carried out. The focus of the camera is adjusted for each photograph. The light available is measured, and the exposure that will allow the right amount of light to reach the “film” is computed. The correct exposure is then set by adjusting the size of the aperture, or opening, which allows light to enter the camera, and the shutter speed, or the length of time that the shutter opens to admit light. In some types of cameras a number of these necessary steps are automatic. On some simple cameras few or no adjustments are possible. 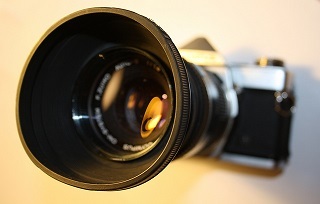 The camera lens focuses light on the film to produce a sharp image. However, the lens cannot focus light from all distances equally sharply. There is always a distance from the lens that produces the sharpest images. By adjusting the focusing ring, this distance can be changed to coincide with the center of interest of the photograph. Generally, the best and most accurate method of determining the amount of light in an area is by using a light meter. For many outdoor situations, however, the light conditions can be expressed in general terms, such as “hazy sun” or “open shadow”. Two general types of light meters are used by photographers. One type measures light reflected from the subject. The other measures incident light, or the light reaching the subject. There are also meters that will do either. The amount of exposure a film will receive is determined by two factors, the aperture and the shutter speed. The size of the aperture, through which light is admitted to the camera, is controlled by an adjustable diaphragm. Aperture settings are expressed not in terms of the actual size of the opening but in f numbers, which indicate the ratio of the focal length of the lens to the diameter of the opening. A given f-number setting produces equally bright images in all cameras, regardless of the actual focal length and aperture size. As a camera is set to higher f numbers, the aperture becomes smaller and less light is admitted. A typical series of f-number settings is f/1.4, f/2, f/2.8, f/4, f/5.6, f/8, f/11, f/16, f/22, and so on. Each number in this series represents an aperture that admits half as much light as the aperture represented by the preceding number. Such numbers are said to be separated by a full stop. Generally, the aperture control of a camera is calibrated in full stops only. The shutter speed is the length of time that the shutter remains open to admit light to the film. Like the aperture settings each shutter-speed setting is half as long as the preceding one. A series of shutter settings might include the following fractions of a second: 1/30, 1/60, 1/125, 1/250, 1/500 and 1/1000. Because the aperture and shutter-speed settings are arranged in such series, there are always a number of pairs of settings that combine to yield the same exposure. Of the many combinations of camera settings that yield the desired exposure, the photographer must choose the best. Camera lenses generally function best at the middle f-number settings, so these should be chosen when possible. Also, shutter speeds slower than f/50 of a second generally should not be used unless the camera can be supported by a tripod or some other stable object, because the photographer may jar the camera. The two most important factors in selecting the right combination are subject motion, which affects the choice of shutter speed, and depth of field, which affects the choice of aperture. The photographer should normally use a shutter speed fast enough to prevent the image from being blurred by a sudden motion of the subject. A speed of 1/100 of a second is usually sufficient. For subjects in rapid motion, higher speeds can be used to get an unblurred image. For example, a speed of 1/1000 of a second can produce a photograph of a bird in midflight, with its wings seemingly motionless, or one of poured water seemingly suspended in air. However, very high shutter speeds often produce a frozen effect rather than one of rapid action, and it is often better to use a slower speed where slight blurring will give an impression of motion. When a camera is focused on a subject at a certain distance, other objects nearer to and farther from the camera will also be in focus. The distance from the nearest object in focus to the farthest in focus is called the depth of field, or zone of sharpness. The extent of the depth of field increases as the aperture decreases or the f number increases. For example, with the camera focused at 10 feet and the aperture at f/4, the depth of field will extend from about 9 feet to about 12 feet. At f/16 the depth of field is from 7 feet to almost 30 feet. Most of the depth of field is located behind the focusing point. In landscape photographs and other pictures made from a distance the photographer generally wants all objects reproduced sharply and will try to use a small aperture. On the other hand, in taking a closeup photograph of a flower it is a good idea to make the background relatively unsharp. This can be done by using a large aperture, so that the shallow depth of field will put the background out of focus.